Small efforts bring big results: If you want to write the next great American novel, then you will have to write it one page at a time. Your first draft may look nothing like the novel you will end up writing eventually, but making small improvements will add up in the end. Breaking a big task into smaller tasks makes your goals attainable. If you want to change a bad habit then change it slowly. A lot of people try to break a bad habit overnight. It took you years to grow that habit and make it a part of your life, how can you expect to break it overnight? If you are trying to lose weight for instance, will you consider losing all the weight in a day by crash dieting and exercising all day at the gym? If you did that, chances are over-exercising will cause you to injure your muscles or worse still break a bone and throw you out of track for weeks. If for instance you are trying to improve your vocabulary, then reading the entire Webster dictionary in a weekend is not going to yield positive results in the long run. If you cannot fully capture and understand the meaning of the words you are learning you are sure to forget them eventually. Instead of planning to read the whole dictionary in a matter of weeks, try to make a more reasonable plan and then stick with it. Even if you learn nothing more than one word a day, by the end of the year you would have learned 365 new words, which is at least 365 words better than nothing! People who are rich will often tell you that the secret to making it big is not only about making more money, but saving the money that you already make, and then making intelligent investments. If you cannot save too much, then just start it small. If for instance, you can only save $100/= every month, then by the end of the year you are $1200/= richer than before. Investing even that small amount wisely will bear dividends over a long period. Often the difference between successful and unsuccessful people is simply, that successful people realize the value of small improvements. Sustainability is key: Remember the story of the turtle and the hare? The turtle was a lot slower than the hare, and yet it was the turtle, not the hare that eventually won the race. It wasn’t the speed, but the consistency that helped the turtle win the race. Remember, people who achieve success do so by making consistent efforts over time. Self improvement is not a weekly or monthly goal; it is a lifelong pursuit. If you want to get good at playing the clarinet for instance, then you will have to make a commitment to spending the time honing your skill every day. Dangers of the Faustus syndrome: Remember Doctor Faustus from Christopher Marlowe’s famous play “The Tragical History of the Life and Death of Doctor Faustus,” who sold his soul to the devil to gain instant ultimate knowledge?Doctor Faustus’s fault was not his desire for knowledge, but his avarice to pay any price for it. In truth, we all have a bit of Doctor Faustus in us, in that we wish to achieve our dreams overnight. Beware of Doctor Faustus syndrome; it does not bring happy endings in fiction or in real life. Conquer your Donut: Are you one of those perfectionists who believe that whatever you do should be top-notch, or why do it? There is nothing wrong with aspiring for the skies, as long as you realize that to fly high; you will still need to take off from the ground.If you are learning to cook for instance, don’t expect to put Rachel Ray to shame with your very first concoction. Have you ever gone on a healthy diet, only to find yourself getting tempted by a donut? And since you indulged in that one donut you felt so disheartened you completely gave in to your cravings and decided to start your diet another day? Donuts are evil. Don’t let a donut ruin your resolve. “All or nothing” attitudes are counterproductive and take us away from our goals. If you gave in to your indulgence, so what you still have the rest of the day to make up for it. Get back on track to achieving your goals. 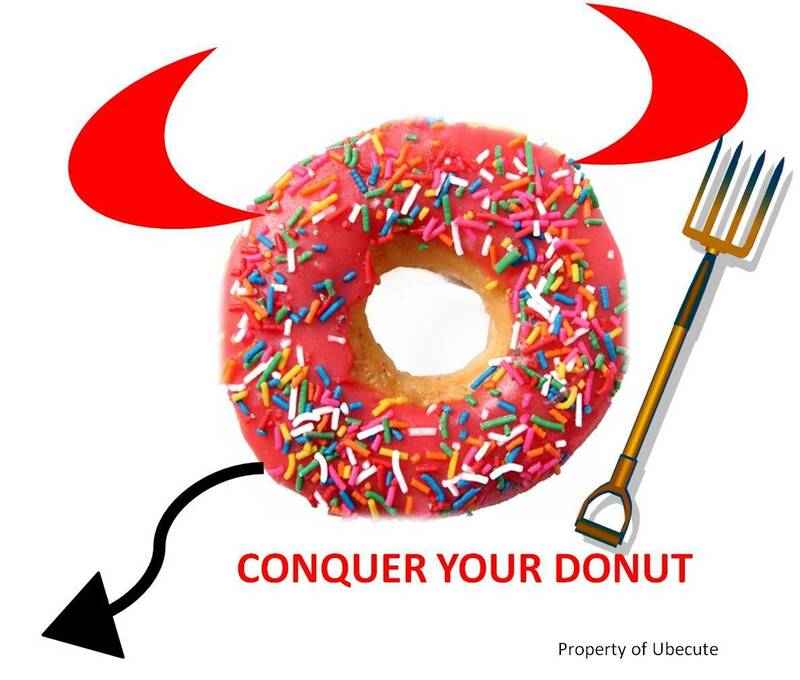 Conquer your donut! Don’t aim to do it right the first time: I know that sounds so counter intuitive let me explain. In a self development course I took long ago, we were trained to “do it right the first time.” The concept being that the cost of fixing a mistake is a lot higher than doing it right the first time. While the concept is absolutely correct in theory, how many of us are born with skills that will allow us to do it right the first time, every time? How many of us are born with golfing skills, for instance, that allow us to win a “hole in one”? Sure getting the hole in one, will save a lot of time and effort, but is that always feasible? And should one never attempt to do a task for the fear of getting it wrong? There may be a handful of geniuses coupled with a few lucky strokes out there that will get a hole in one, but for the majority of us, our “hole in one” may require hundreds of shots. I am not sure why the power of small eludes us? A child first learns to kick its feet before it learns to crawl. The child will then learn to grab on to things to try to stand up before it learns to walk and eventually run. Yet as grownups, we forget life’s elemental lessons and wish to run before learning to kick. Knowledge and skill grow at a gradual pace; these are not lotteries one can win at Vegas. Start it small, take it slow and continue making your efforts consistently. 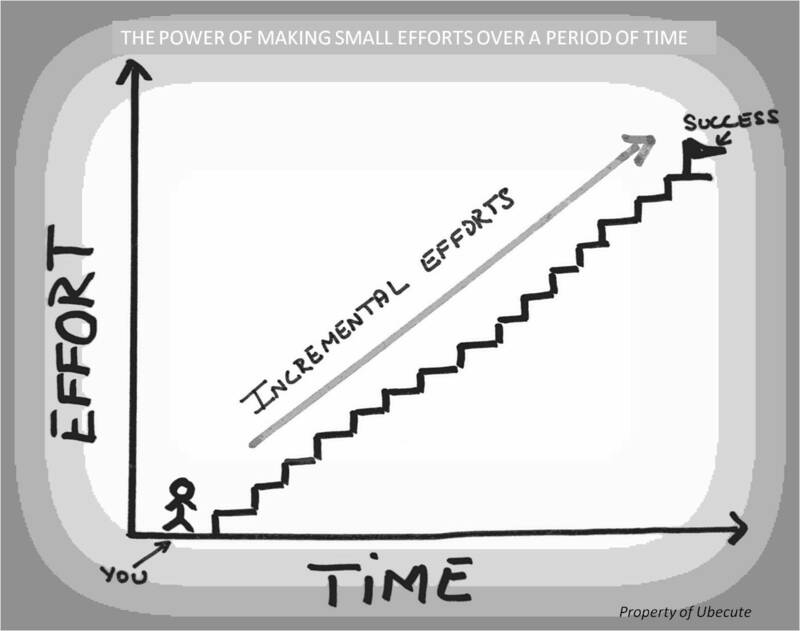 Sooner or later it is these small efforts that will bring BIG results. Thank you for the reminder, I’ve been struggling lately with finding the Energy to continue to pursue the kind of future I desire. Although I know better, I’m still guilty of a bit of Dr. Faustus syndrome. Thank you for the reminder to keep it small, and with determination I will do better as time passes. You are welcome. Glad you like. Very good advice. I struggle all the time with trying to conquer the whole problem in one step, and then I get overwhelmed and give up. It’s a challenge to take one small step at a time. Very wise words that I often have to remind myself daily. Consistency is key! Thank you so much for putting in the time to write such a wonderful post! Thank you so much for your kind words. Consistency is key. But what is more important is the knowledge that you really don’t need too much time on anything, instead even if you spend just a little bit of time on the interests of your choice everyday, then over a period your knowledge will grow exponentially. Lovely piece of advise; that’s so true. “Little by little one waqlks far”! I liked the reminder: Don’t aim to get it right the first time That’s a biggie for me – and I expect it of myself. Always. And guess what? I’m discouraged and displeased if I don’t, which only hampers my chances of trying again, when my chances of getting it right would be that much better. I am taking deeper breaths, which is helpful, because what I am working on needs more than one shot to get right! I hear you wendykarasin. We are too hard on ourselves sometimes. It takes as many times as it will take to get it right. Trying is a lot better than not trying at all. We fail 100% when we don’t try at all. Thank you for your great insight. Much appreciated. Yes. I needed to read this post today. (And perhaps reading it was the first small step…) Thank you. Couldn´t agree more. And actually I still have to find the person that has reached success from one day to the next, or loose weight from one day to the next, or just about everything in life. Vegas…and you know the Mob started it right? No wonder they call it sin city. So true, small incremental changes are definitely the way to go. Thank you. Thanks also for stopping by. Agreed my friend. Thanks for your comments. 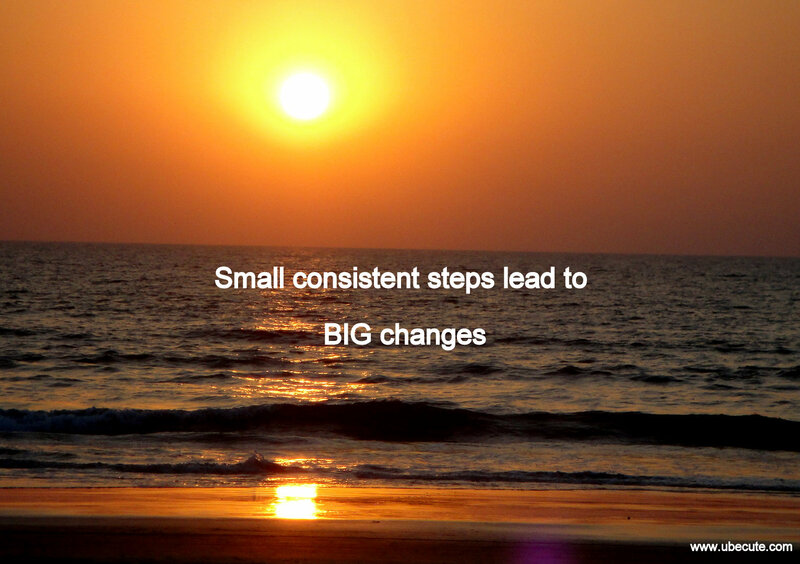 In my career in industry and also in my role as a life coach I have always advocated that 101 small changes work more effectively that one great mega change. For example if you normally eat 2 chocolate biscuits every day with your tea or coffee and only eat one instead you will lose 15lbs in 12 months. This of course assumes that you do not compensate by eating a Danish pastry instead with your coffee. However, this is an excellent post about the power of small. Thank you for your thoughts and for reblogging my article. Have a great day! Actually, there are no small acts. Every act has the potential to change anything. A small act of kindness can do wonders. A small stone can create multiple ripples is the large ocean. The “conquer your donut” idea was absolutely beautiful. I’ll write that on my to-do list next time I’m tempted. Thanks for the inspiration! brilliant article! thoughtful, deep and inspirational!